Israeli jets early on Sunday morning carried out a second round of airstrikes in a matter of hours the Gaza Strip, the army said, after four projectiles were fired overnight at southern Israel by Palestinian terror groups in the coastal enclave, shattering an unofficial ceasefire agreement. The Israeli raids targeted “five terror targets in a military compound belonging to the naval force of the terror group Hamas in the northern Gaza Strip,” the Israel Defense Forces said. The air force on Saturday night had carried out 10 airstrikes on Hamas targets in response to earlier rocket fire. Responding to four separate attacks on southern Israel in the predawn hours of Sunday, the Iron Dome missile defense system intercepted three projectiles, with another apparently landing in Israeli territory, the army said. Thousands of Israelis were sent rushing to bomb shelters throughout the night as sirens were repeatedly triggered to warn of incoming fire. The army said it held Hamas, which rules the Strip, responsible for the rocket attacks. The first projectile was launched shortly after 12:30 a.m., setting off sirens in the southern town of Sderot and surrounding Sha’ar Hanegev region. The second was fired less than an hour later, triggering alarms in the Eshkol region, the army said. At 2:45 a.m., sirens sounded in the Sha’ar Hanegev and Hof Ashkelon regions in southern Israel as another projectile was lobbed at southern Israel. All three were shot down by Iron Dome, the army said. It was not immediately clear if the projectiles were rockets or mortar shells. At 3:20 a.m., sirens again went off in the Shaar Hanegev and Sdot Negev regions, with the army confirming another “launch from the Gaza Strip to Israeli territory,” and identifying the projectile as a rocket. According to the Walla website, it exploded in an open area. There were also several rocket attacks earlier on Saturday evening. The renewed rocket fire followed significant clashes on the Gaza border on Friday and a massive flareup last week, in which Palestinian terror groups launched over 100 rockets and mortar shells into southern Israel and the military responded by striking more than 65 Hamas and Palestinian Islamic Jihad sites in the Strip. 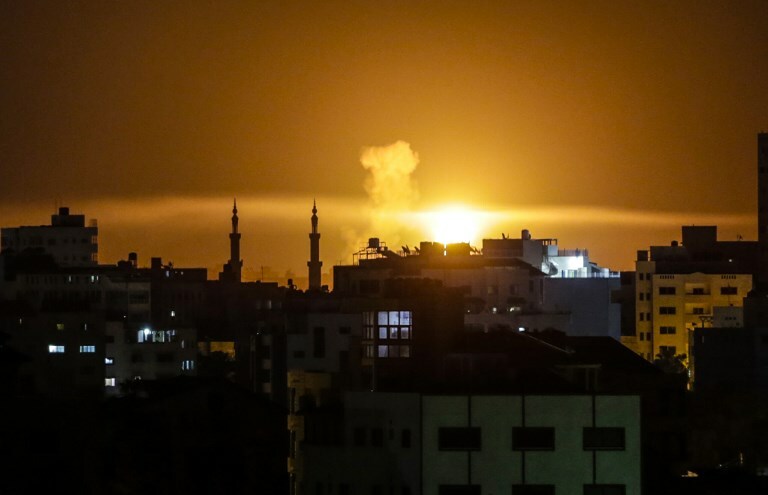 In response to the rocket attack on Saturday evening, the IDF launched its first strikes on targets throughout the Gaza Strip just before midnight. “The IDF, using fighter jets, attacked 10 terror targets in three compounds belonging to the Hamas terror group in the Gaza Strip. Among the targets that were attacked were two sites used to manufacture and store weapons and a military compound,” the army said. According to the Hamas-affiliated Shehab news agency, the planes struck sites in Gaza City’s Shejaiya neighborhood, in the Nuseirat refugee camp and outside the city of Khan Younis. The Palestinian Quds news site also reported Israeli strikes outside the city of Rafah. A video, posted on social media, reportedly showed the bombing of the targets in Shejaiya, which sent a large fireball into the sky. On the Palestinian side of the border, thousands attended a funeral for a young female volunteer medic, who Palestinians say was shot and killed by the IDF while tending the injured during violent protests on the Gaza border. The border tensions comes following a week that saw the worst escalation of violence between Israel and Hamas since the 2014 war in Gaza. Palestinian terror groups on Wednesday and Thursday fired more than 100 rockets and mortars at towns and cities in southern Israel, and the IDF responded with dozens of airstrikes on Hamas military targets. After almost 24 hours of fire, a tacit understanding and unofficial ceasefire began, though both sides have described it as fragile. Also Saturday night, firefighters were working to put out three large fires in Israel along the Gaza Strip border, believed to have been started by incendiary kites flown from the coastal enclave on Saturday. The largest fire was near Kibbutz Carmia, adjacent to the northern Gaza Strip. Preliminary estimates suggested that between 2,000 and 3,000 dunams (500 to 740 acres) of fields and parts of a nature reserve adjacent to the kibbutz were destroyed. This entry was posted on June 3, 2018 at 6:53 AM and is filed under Uncategorized. You can subscribe via RSS 2.0 feed to this post's comments. You can skip to the end and leave a response. Pinging is currently not allowed.